Louise Arner Boyd is credited with being the first woman to travel to the North Geographic Pole. In 1955, at age 67, Boyd chartered an airplane to fly her over the North Pole. This north pole flight, that she described as being the fulfillment of a childhood dream, was the culmination of a lifetime spent leading scientific expeditions to the north polar regions. Louise Boyd was born in 1887 into a wealthy San Raphael, California family. In 1920, following the deaths of both her parents, Boyd inherited a sizable fortune and spent the next several years touring Europe. Her first trip to the Arctic occurred in 1924 when she traveled to Spitsbergen, then a popular summer destination for European tourists, on a Norwegian cruise ship. In 1926, she chartered the Norwegian sealer Hobby to take her and a group of friends to Franz Josef Land to hunt polar bears. The Search for Amundsen. Boyd first gained prominence in the Arctic in 1928 when she had again chartered the Hobby. She was in Troms� on the northern coast of Norway when word arrived that the great Norwegian explorer Roald Amundsen was missing on a flight from Troms� to Spitsbergen. Amundsen and five companions had departed Troms� in a French-built seaplane enroute to Spitsbergen to aid in the rescue operations for survivors of the crash of the airship Italia off the north coast of Spitsbergen. Boyd immediately placed herself and the Hobby and its crew at the disposal of the Norwegian government to search for Amundsen. Despite an exhaustive search that covered approximately 10,000 miles and ranged from Franz Josef Land in the east to Greenland in the west, Amundsen's remains were never found. Boyd received the Chevalier Cross of the Order of Saint Olav from King Haakon VII of Norway, the first non-Norwegian woman to be awarded such an honor, for conducting the search. The Greenland Expeditions. In 1931, Boyd returned to the Arctic to lead a scientific expedition to the fjord region of the east coast of Greenland. It was the first of five Greenland expeditions that Boyd would lead. She returned in 1933 to study glacial formations in the same area. Boyd led expeditions in 1937 and 1938 that discovered and studied the submarine ridge lying between Bear and Jan Mayen Islands. In 1941, following the outbreak of World War II in Europe, she led yet another Greenland expedition, this one sponsored by the US government to study the effects of polar magnetism on radio communications. In 1942 and 1943, she served as an adviser on military strategy in the Arctic. In 1949, the U.S. Army awarded her a Certificate of Appreciation for her wartime work. Two of Boyd's books, The Fiord Region of East Greenland (1935) and The Coast of Northeast Greenland (1948), describe the Greenland expeditions. The North Pole Flight. After such an auspicious career, Boyd could have retired quietly from public life, but there was still one thing left for her to do in the far north. In 1955, at age 67, she chartered a DC-4 aircraft with a Norwegian crew to fly her over the North Pole. The 16-hour flight departed Bod� in northern Norway and flew non-stop to the pole and back. This was the first privately financed, non-commercial and non-military flight over the North Pole and the first to depart from mainland Norway. It also gave Boyd the distinction of being the first women to travel to the North Geographic Pole. Boyd died in 1972 at age 85. In 1986, Ann Bancroft of the Will Steger expedition reached the North Pole and is credited with being the first female to set foot on the surface of the pole. But since Boyd devoted a whole lifetime to arctic and polar exploration, it seems fitting that Louise Boyd should additionally share the honor of being the first woman to travel to the North Pole. 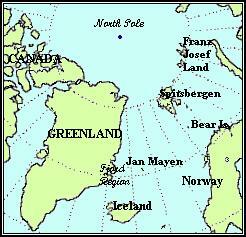 Boyd's travels took her to Franz Josef Land, Spitsbergen, Bear and Jan Mayen Islands, and the heavily indented fjord region of Greenland. In all, she led seven expeditions to the Arctic. In 1937 and 1938, Boyd led expeditions that discovered and studied the submarine ridge lying between Bear and Jan Mayen islands. The search covered approximately 10,000 miles and ranged from Franz Josef Land in the east to Greenland in the west. It is now presumed that Amundsen and five crew-members went down between Troms� and Bear Island. Their remains were never found. 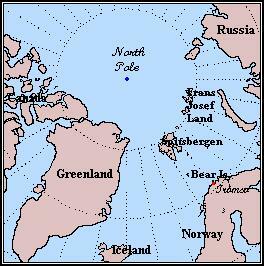 For more North Polar Regions maps, click here. Suggestions for further reading: Boyd's full biography has yet to be written, but a good short account of her life is included in the book, Women of the Four Winds. For more details about the book, click on the cover image. Short biographical sketch of Boyd, click here. Brief Columbia Encyclopedia entry for Boyd, click here.